We are committed to promoting responsible pet ownership, preventative health care and health-related educational opportunities for our clients. 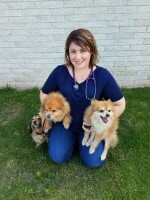 Critter Care Animal Clinic strives to offer excellence in veterinary care to Sheboygan and surrounding areas. Contact us today! 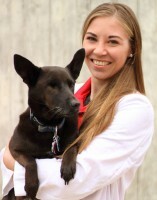 Dr. Stephanie Greetan graduated from UW-Madison veterinary school in 2008 and joined Animal Clinic in 2010. She purchased Animal Clinic along with her vet tech Crysta Ladwig in March 2016 and renamed the clinic Critter Care Animal Clinic. Her special interests include geriatric care, preventative medicine, and dermatology. She has a passion for shelter medicine and served on the board of directors for the Lakeshore Humane Society in Manitowoc for 6 years. Dr. Greetan currently serves as an advisor to the board of directors for the Sheboygan County Humane Society. Dr. Greetan shares her home with her husband (Andrew) and stepson (Matthew), their pack of rescued dogs - Brewster (hound mix), Gustav & Norman (Eskimo/Pomeranian mixes), Reese & Buddy (long-haired dachshunds); as well as the rest of their zoo - a bearded dragon (Winston), a panther chamelon (Mr. Pickles), a green-cheek conure (Roscoe), a red-footed tortoise (Raffaela), a uromastyx (Earl), three Eastern Collared lizards (Mortimer, Maise, Mavis) and a flock of chickens. Dr. Kate Kornowski grew up in Green Bay, WI and attended UW-Green Bay while learning about wildlife rehabilitation at the Bay Beach Wildlife Sanctuary. She graduated from UW-Madison School of Veterinary Medicine in 2016 and began working at Critter Care soon after. Dr. Kate has special interests in wildlife rehabilitation and medicine, dermatology, feline medicine, and preventative care. In her free time, she enjoys hiking, birdwatching, and taking long walks on the beach. Dr. Shanna Reed grew up on a dairy farm in Southwest Wisconsin. She attended the School of Cytotechnology at UW-Madison after graduating from UW-Platteville. She earned her Doctorate of Veterinary Medicine from Iowa State University in 2017. Dr. Reed has interests in pathology, oncology, and preventative medicine. She lives with her husband along with her two rescue dogs Lucy (Australian Kelpie) and Wisco (Labrador Basset Hound mix).